Landslides threaten most parts of the provincial state of Lower Austria and cause damage to agricultural land, forests, infrastructure, settlements and people. Thus, the project “MoNOE” (Method development for landslide susceptibility modelling in Lower Austria) was initiated by the provincial government to tackle these problems and to reduce further damage by landslides. The main aim is to prepare landslide susceptibility maps for slides and rock falls and to implement these maps into the spatial planning strategies of the provincial state. 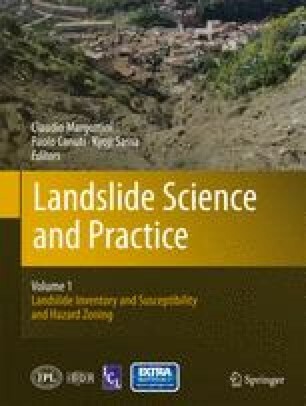 Landslide susceptibility maps are either prepared by statistical (for slides) or empirical or process-based (for rock falls) approaches. Final maps are combined to a single landslide susceptibility map and optimised for the end-users (spatial planners and local authorities). It shows that a difference exists between the best scientific maps and the best maps for spatial planning purposes. This involves questions about the best number of susceptibility classes, its thresholds and ideal colours. The authors thank several institutions and individuals for their support: the colleagues from the Geological Survey of Austria and from the Austrian Service for Torrent and Avalanche Control for providing inventory data; the Provincial Government of Lower Austria in particular the colleagues from the Geological Survey and the Department of Spatial Planning and Regional Policy for inventory data. Thanks to them for supporting the MoNOE-project and for numerous fruitful discussions. Thanks also to the Department for Hydrology and Geoinformation for providing LiDAR and orthophoto data. Finally, the authors are grateful for financial support of the Provincial Government of Lower Austria.